Both types of mochi cakes have a soft consistency, neither are baked and crispy. However, a butter mochi cake is crispy and buttery on the outside, and satisfyingly chewy on the inside and it originates from Hawaii! 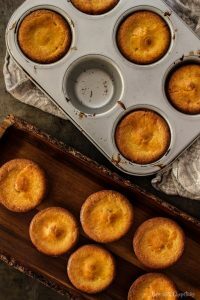 I have only ever seen a butter mochi cake made baked in a square/rectangle baking dish and cut up into squares but being as I was obsessed with the crispiness, I asked myself “How do I maximize the crispy surface area?” – in came the muffin tin! I want to dedicate this post to Heather and her Aunty Lily for introducing me to a new type of cake with unique textures that I can honestly say is now my all time favourite snack. (In a span of 2 weeks I easily ate almost 3 full batches of it myself – these things are ADDICTIVE!!) 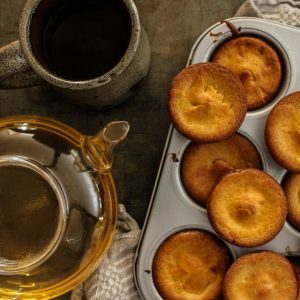 These bite-sized cakes really do give a sense of warmth – from the smells in the house to enjoying them with a cup of hot tea. This recipe is an adaptation from her Butter Mochi cake recipe. For this butter mochi cake, half of these ingredients will be available at your local grocery store. The trickier items to find would be the glutinous rice flour and possibly the coconut cream. Coconut cream is slightly thicker and fattier than coconut milk. My main reason for using this is because of the fantastic coconut flavour it imparts and it contains a bit more fat as well which gives the cakes a crisper texture. When you are shopping for this, make sure you shake the can. It should be thick and you shouldn’t hear much. If it is watery then find another brand. If you cannot find coconut milk, try to find coconut milk with a higher fat content – I find those are generally thicker and more coconutty but if you do opt with coconut milk, be mindful that it is a lot less coconutty and a lot waterier than coconut cream. To prevent your batter from becoming too thin, you may need to cut back on the milk. 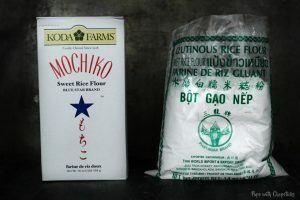 For the glutinous rice flour, the more popular choice that never fails would be the Koda Farms Mochiko Sweet Rice Flour, but it may be more difficult to find but can usually be found in an Asian grocery store. The box of flour comes conveniently with the right amount of flour – 1lb. You will be using the whole box of this. Note: Although it is labeled as ‘Sweet Rice Flour’ this is still glutinous rice flour. I have tested this recipe with the other brands and types glutinous rice flours as well, mainly the more common ones that come in a plastic bag packaging. Make sure you are purchasing glutinous rice flour and not rice flour. Usually, the glutinous rice flour ones are packaged with green writing and the rice flour is packaged with red writing. Most of them still come in 1 lb bags (16 oz) but some brands come with 50 gm less flour in these bags. Another thing I noticed when using these types of flour is that it uses less liquid to create the same batter consistency. The cakes turned out a little less chewy but just as tasty, but won’t come out exactly the same as using the Koda Mochiko flour. Uhmmmm Baking should be precise! How can you have so many substitutions?! Why yes, yes it should be precise and that is an excellent question! I wondered the same myself! Butter mochi cake is very forgiving. My assumption is because of the texture of this cake – it’s chewy and holds moisture well from the rice flour’s starchiness, so it’s kinda hard to mess up that texture with minor substitutions. As long as your end product has the consistency of a pancake batter – you’re good! Combine the Wet Ingredients Except for the Milk – Melt the butter and coconut cream in the microwave for a few seconds (Approximately 45 seconds but do this 10-15 seconds at a time, butter goes NUTS in the microwave – I did this for 60 seconds straight and half the butter ended up outside of the bowl. Cleaning up butter is not fun.) Add the melted butter and cream into a large bowl and condensed milk, vanilla and mix well. Add in the eggs 1 at a time and mix well. Add in the Dry Ingredients & Mix Well – Add in the flour, sugar and the baking powder and mix well. 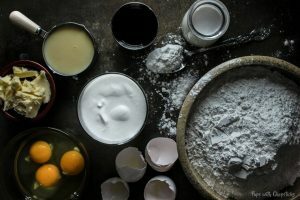 At first you will see lumps but if you keep mixing, it will become a smooth batter – No need for electric mixers, I found using the whisk was enough. Add in the Milk – I added the milk last because depending on what type of flour or coconut cream/milk you use, you want to control how much milk to add to get the right consistency. You can slowly add, but you can’t take out. If you are following the recipe without substitutions then 1 cup of milk is good, but if you are not following the instructions to the tee then add in 1/4 cup of milk at a time until you reach a nice pancake batter consistency. Run your fingers through the batter and if it holds it’s shape and it’s not too runny and not too thick then you’re good! I actually found that if you let your batter rest for 15-20 minutes, it gave the cakes an even better texture! How Do You Store Butter Mochi Cake? These keep very well in a well-sealed container, in the fridge. To crisp them up again, pop them in the oven at 350F (177C) for about 15 minutes and then let it cool so it can reform the crispiness and they will taste even better than the first day you baked them. Letting them sit for a day in the cold, gives the cake an even chewier and denser texture in the middle! Mini Buttery Coconut Mochi Cake that have been sweetened with condensed milk & are crispy on the outside & chewy on the inside with hints of vanilla & coconut. Add in the eggs 1 at a time while whisking. Slowly add in the milk and mix until the batter is smooth. You want to achieve a pancake batter consistency. Run your finger through the batter on a back of a spoon and if it keeps it’s shape and it’s not too runny or thick then you’re good. 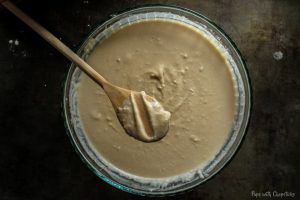 [Optional] Let the batter rest for 15 to 20 minutes so that the batter to come to room temperature, this gives the cake a chewier and crispier texture. Butter the muffin tin liberally and fill them 1/4 cup of batter per cake. Bake for 45 minutes to 1 hour (until golden brown) on the middle rack in the oven. At the 45 minute mark, check to see if they are golden brown. Try to find a high fat content coconut milk if you are substituting it for the coconut cream. Make sure the eggs and milk are room temperature, this gives the cake a better texture. Some coconut creams are thicker than other depending on what brand you buy. If your batter comes out too thick from the thicker coconut cream, you can add 1-2 tablespoons of milk to thin it down a bit. Really great recipe! Wondering if you have substitutions to adapt this recipe to other flavors? I am so happy you liked it! I actually haven’t tried adapting new flavors to it yet! I plan to someone this year for fun. I imagine a little cocoa powder would make it chocolate (but not too much since cocoa powder is quite drying and might change the chewy texture). Same goes with matcha powder, that actually might be a fun one to playtest as well! If I ever add additional flavors, I will definitely update the recipe card with options and let you know! I was a bit skeptical as to why a coconut recipe would require 2 tablespoons of vanilla so I followed the recipe exactly BUT used only 1 tablespoon of vanilla. It was still too much and definitely overpowered the desired coconut flavor. Next time I will skip the vanilla altogether and instead add a tsp or two of coconut extract. What I did like is that they aren’t overly sweet and cloying. I’m really happy you improvised! 🙂 The coconut cream I usually use is very thick like butter with a lot of coconut flavor but recently, I have been trying different brands of coconut creams and I have been noticing that not all coconut creams are created equal and a lot of them are a lot runnier with a lot less coconut flavor, so I’m wondering if that may also have something to do with it as well, but nonetheless I’m still happy you are tweaking it to your preference. 🙂 I have been toying around with coconut extract for the last batch and it actually turned out very tasty. So after a few more test batches I might update this recipe with an optional coconut extract as well. I’m wondering if it’s really 2 tablespoons and not 2 teaspoons of vanilla? is it really 2 tablespoons and not 2 teaspoons? I just tried this recipe! Love the crispy and chewy combo! I am wondering if you have any suggestions how to get more coconut flavor …. I have never tried adding coconut extract, but that is also an option as well to give it a bit more coconutty flavor. 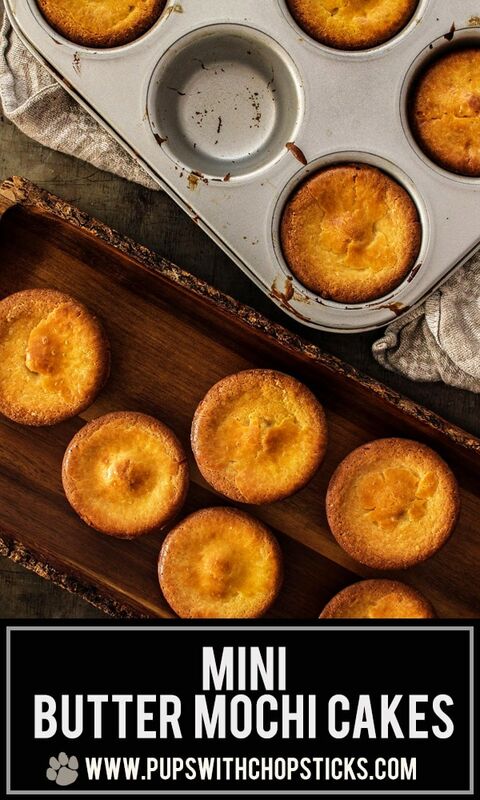 have you tried this with mini muffin tins? wondering how baking time might be adjusted. thank you! I have not tried to do it with a mini muffin tin for this recipe. If you want to try using really small muffin tins, I would reduce the cooking time by half, so in this case 20 to 30 minutes a batch. I would also do a toothpick test to make sure the middles are done before removing them from the oven – Insert a clean tooth pick in the middle and when you pull it out, it should come out cleanly with no wet batter. You might need to adjust the cooking time slightly. Easy ingredients to make a delicious mochi cake! Mine didn’t turn out as golden brown as yours but they still tasted good. Next time I’ll use muffin cups in the tray because the cakes were difficult to pop out even after i thought i brushed enough butter in the tins. Hello! I would love to make these, but is there a substitute for the eggs? My kids are very allergic. Thank you! Hmm… I have not tried substituting the egg before so I am not 100% sure..but if I had to test it out I would maybe try 3/4 cup of unsweetened apple sauce with 1/2 teaspoon bit more of baking powder? The cakes might be a little bit denser but I think it’s okay, since these are meant to be chewy! 🙂 I’ve also heard of using soft tofu (the really really soft silken one, beat until liquid-y), as a egg substitute but I’m not 100% sure if those are easy to find. I usually find them at Asian grocery stores. Thanks so much for the responding with a sub for the eggs! I made them and tasted soooo good! I’m not sure about the consistency compared to the original recipe with eggs, but the taste was great. The only problem was it stuck to the muffin liner and didn’t come out, any thoughts? I’m also going to try without the liners. Hi Sonya! I’m super happy to hear you liked it! I find them quite addictive too and make them a lot too heehee. 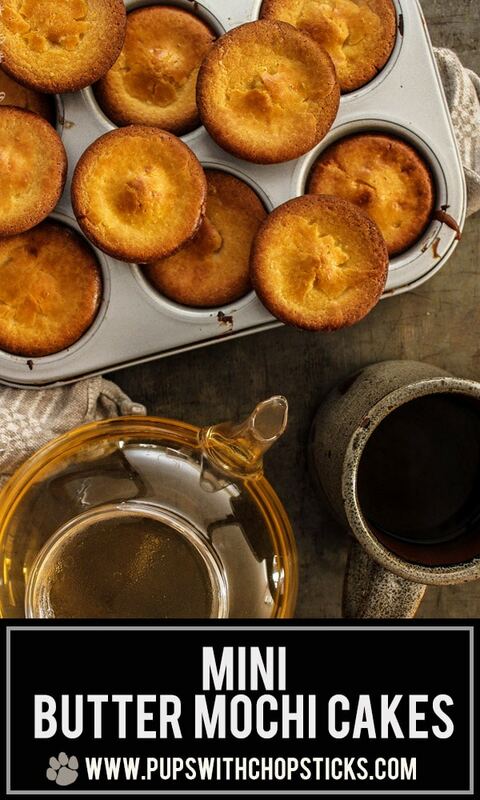 I have had a hit or miss with them sticking in my pan as well depending on which type of muffin pans I used. I found the teflon ones worked the best for me. 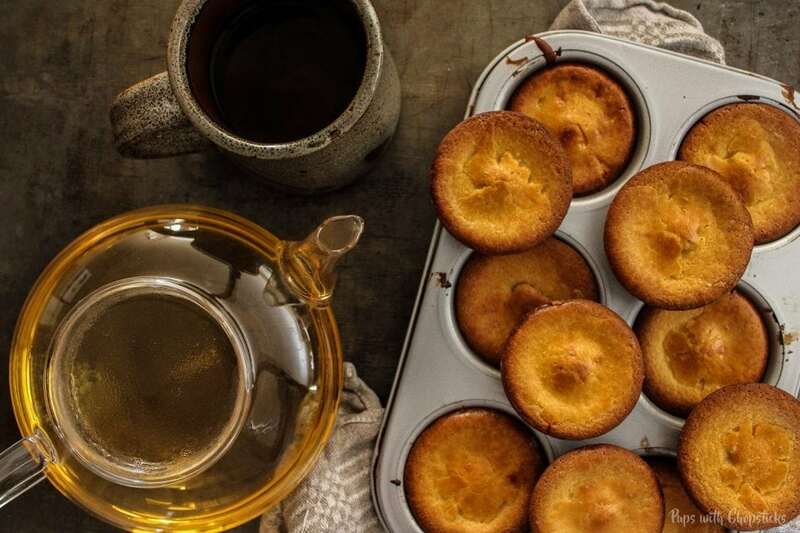 Another method that might also work is to generously butter the muffin pan and the dust the butter with flour and then throw out any excess flour. The goal is to make the butter have a light coating of flour. I usually use this method for muffins, but I have no tried this for these mochi cakes. I plan to test this out soon. So I made another batch this weekend without liners and using the Pam butter spray and they didn’t stick at all! Crispy on the outside and chewy inside! Thank you so much again for the substitutions and being so good about replying! I used your exact substitutions and it worked great! I’ve already made this 3 times and its seriously one of my top desserts/snacks to have now! Its also really nice because its free from all my kids allergies, so can eat in front of them and share with them! Please post other mochiko recipes!! Hey, just confirming, you meant 1/2 tsp more baking powder, not baking soda right? Ok thanks so much for the quick reply! That is what I did previous times, but I’m making again now and just checked back and noticed! Thank you so much for the quick response and helpful suggestion! I’m from Hawaii but wanted to try a new butter Mochi recipe. Clear and direct instructions. Thank you. Everything came out as planned but I didn’t use sweetened condensed milk. I used what was listed, and then I read the comments. Anything I can do or serve with this to make it more sweet? Don’t want to toss the full batch. Hmmm I have personally never used cream of coconut before, I am assuming it has the same consistency as condensed milk and is basically coconut cream with added sugar? If it is, then I don’t see why you cannot substitute it but yea, it might be very very sweet – but you seem okay with that! 🙂 Also, does the cream of coconut have any fat in it? Coconut cream has a very high fat content so make sure cream of coconut does as well. I made these yesterday and I thank you for your recipe. Re: the amount of muffins yielded- would it be accurate to say they almost fill 3 pans? So not 36 muffins but that the last pan fits 8? Also- I hesitated while adding the can of condensed milk because it’s not 300 ml. It is closer to 400 ml at 396 ml ( or something closer to that) so I only put 3/4 of a can and while they were tasty, they weren’t sweet. I’m just wondering if we were using different brands with different can sizes and how sweet your muffins are to you. 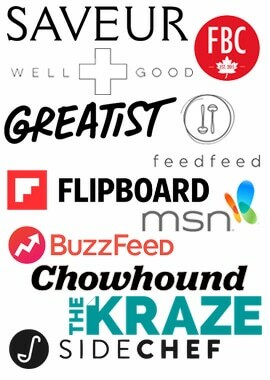 I am happy to hear that you made these! I hope you liked them! For the condensed milk, yes this was meant to be a very lightly sweetened cake 🙂 so you should just taste a touch of sweetness to it. It should be mostly coconutty and buttery. I have used Eagle Brand and Grace brand condensed milks for this however I occasionally switch it up depending on what goes on sale. Did you find it not sweet enough? Everyone does have personal preference of sweetness 🙂 so if you like it a touch sweeter I would say that adding 1-2 tablespoons of sugar will sweeten it up a notch. This recipe is very forgiving that way that you should be able to do it with no issues. I have not tried it yet but I am curious to now! Sorry was this supposed to be sweetened condensed milk? because they have unsweetened condensed milk, but it is a lot more rare.